To think deeply or focus one’s mind for a period of time, in silence or with the aid of chanting, for religious or spiritual purposes or as a method of relaxation. Did you know that U.S. companies have seen an loss of over $200 billion annually on stress-related employee issues including absenteeism and lack of productivity? 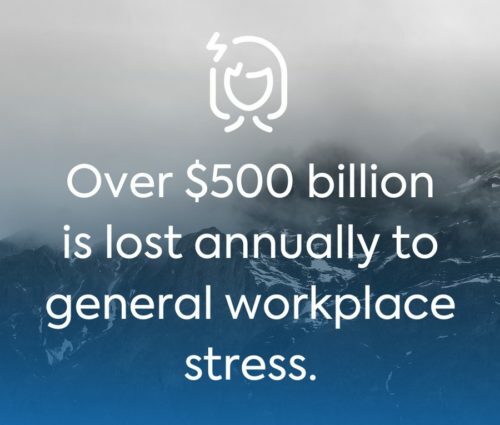 Even more startling is the fact that, according to the American Psychological Association, over $500 billion dollars is lost to general workplace stress. In order to tackle an epidemic as great as workplace stress, companies and organizations must first look to the core root of the problem. While the workplace certainly has business demands that cannot be compromised, finding ways to encourage healthy workplace practices is the key to finding the balance between work and overall mental health. When was the last time you felt as if you truly took a break from everything you were doing at work? Depending on the industry, it may have been a very long time. From working lunches, to mobile work emails, to the stress of an upcoming project, the vast majority of individuals are unable to truly break from all that their professional life is throwing at them. What does a true break feel like and what can it do for your overall performance? Tackling workplace stress is on the priority list of many, many companies. With things such as absenteeism, turnover, and overall productivity on the line, it should be number one on a list of things to work on. Through meditation, companies have found tremendous success in these areas and beyond to better their employee’s overall health and well-being. 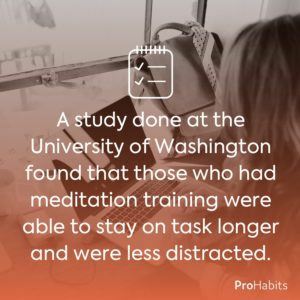 A study conducted at the University of Washington found that those who had meditation training in the workplace were able to stay on task longer and were less distracted. 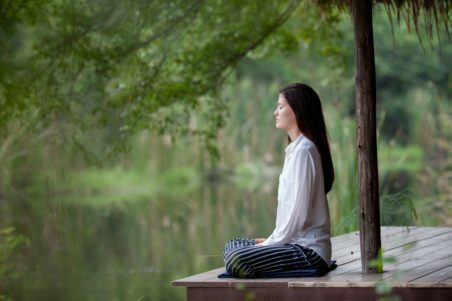 Meditation also improved memory and alleviated stress in those that participated in the study. Finding ways to implement meditation strategies into your company’s day-to-day lives can help set them up for success within your organization. Companies across the world have found the benefits of doing so and are seeing tremendous results within their teams. Utilizing meditation techniques and practices isn’t necessarily closing your eyes, putting your fingers together, and saying “ohm” until you feel more relaxed. There are countless ways to take a few moments for yourself during the day to focus and recenter yourself, it’s just about setting your employees up for success in the workplace by providing them with healthy solutions to workplace stress.